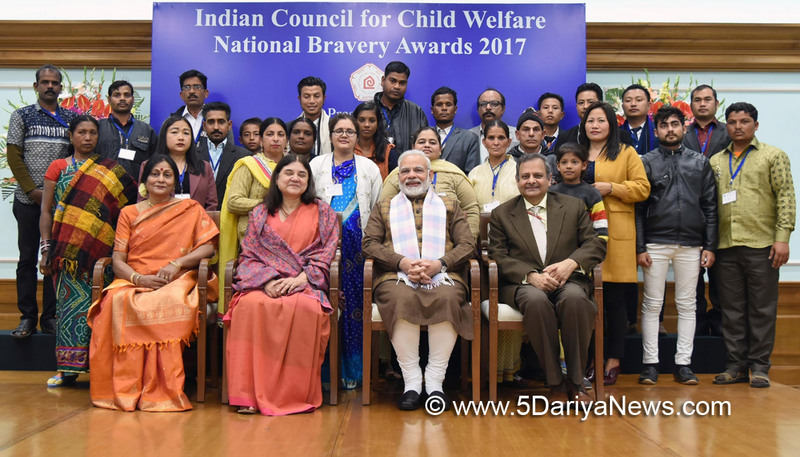 The Prime Minister, Narendra Modi, today presented the National Bravery Awards to 18 children. Three of these awards were presented posthumously.Interacting with the awardees, the Prime Minister said their deeds of bravery are discussed extensively, and also highlighted by the media. Therefore, he added, they inspire other children, and often engender a sense of self-confidence among other children.The Prime Minister remarked that most of the awardees are from rural and humble backgrounds. He said that perhaps their daily struggles had helped instil resilience in them, to deal courageously in adverse situations.The Prime Minister congratulated all the award winners, their parents and schoolteachers. He also appreciated those, who recorded their instances of bravery, and helped draw attention to them.Shri Narendra Modi said that after such recognition, future expectations from the awardees become higher than usual. He wished them well in their future endeavours.The Minister for Women and Child Development, Smt Maneka Gandhi, was present on the occasion.